Plus adds the ability to supplement gorgeous acoustic sound via its specially designed bridge electric guitar pickup. So what is the Plus of the Crowdster Plus? Same amazing guitar as the regular Crowdster, plus the addition of an Anderson electric guitar pickup made especially for Crowdster. So you can blend in or select impressive supplemental electric guitar sounds to augment Crowdster's already substantial acoustic voice. Very versatile and very cool! And again, just like the original Crowdster, there is nothing like it anywhere. Why? 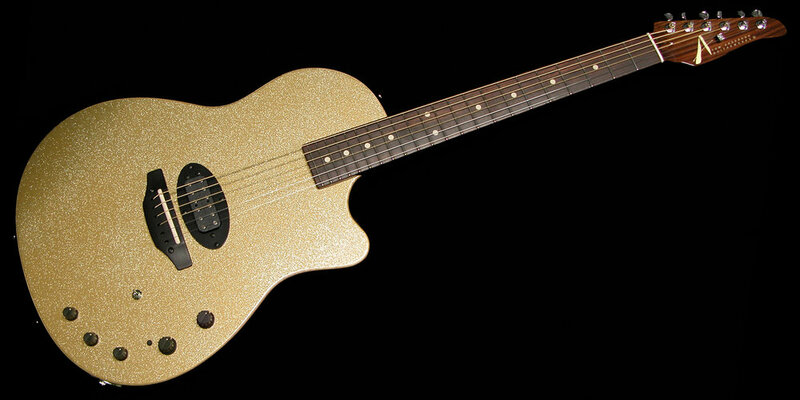 Well one reason is its CMA, Crowdster Plus' electric guitar pickup. CMA has been specifically designed to bring wildly impressive electric guitar tones to Crowdster. Everyone knows that part of an acoustic guitar's distinctive timbre is due to the use of bronze strings, not electric guitar strings. CMA is an electric guitar pickup designed from the ground up to listen for the nuances bronze strings have to offer and balance output into an impressive electric guitar offering. And if that wasn't enough to make you (and everyone listening) completely love your live sounds, there is now: Crowdster Plus N! You may now choose to position your single superlative electric guitar pickup into the neck position, instead of the bridge position, for warmer, smoother and more sultry tones, if that is your desire. From smooth jazz to fat rock rhythm and more, “N” is your pathway.